1.1 What is link aggregation? Link aggregation (a.k.a. trunking, bonding or teaming) combines two or more network connections into one. To use link aggregation, your Ethernet cables must be connected to the same network switch and your network switch must support link aggregation. Your network traffic loads will be distributed across two connections that appear as a single connection in order to increase reliability through redundancy. Combining two network connections provides you with fault tolerance. Should one of your network connections fail, traffic will be automatically directed to the other connection. 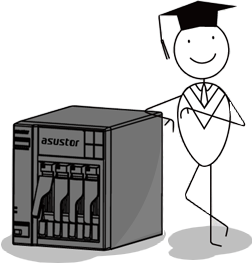 ASUSTOR NAS offers several different modes for link aggregation. Each mode is described briefly below. Round-Robin: Transmits packets in sequential order from the first available connection to the next. This mode provides load balancing and fault tolerance. Active Backup: Only one connection is active. A different connection becomes active if, and only if, the active connection fails. The aggregated MAC address is externally visible on only one port (network adapter) to avoid confusing the switch. This mode provides fault tolerance. XOR: Transmits based on the default simple transmit hash policy. This mode provides load balancing and fault tolerance. Broadcast: Transmits everything on all connections. This mode provides fault tolerance. 802.3ad (IEEE 802.3ad Dynamic Link Aggregation): Creates aggregation groups that share the same speed and duplex settings. 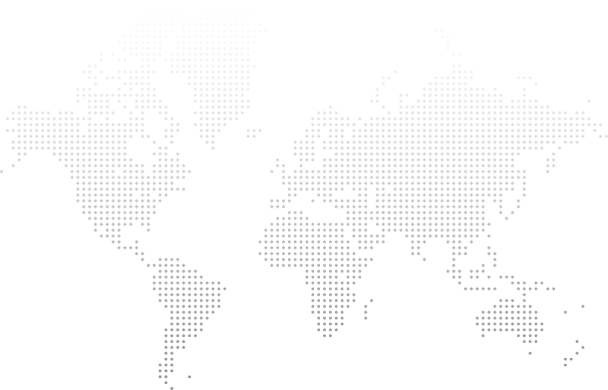 Utilizes all connections in the active aggregator according to the 802.3ad specification. You will need a switch that supports IEEE 802.3ad dynamic link aggregation. This mode provides fault tolerance and load balancing. Adaptive Transmit Load Balancing: Does not require any special switch support. The outgoing traffic is distributed according to the current load (computed relative to the speed) on each connection. Incoming traffic is received by the current connection. If the receiving connection fails, another connection takes over the MAC address of the failed receiving connection. This mode provides fault tolerance. Adaptive Load Balancing: Includes transmit load balancing plus receive load balancing for IPV4 traffic and does not require any special switch support. The receive load balancing is achieved by ARP negotiation. This mode provides fault tolerance and load balancing. Generally speaking, link aggregation modes provide either fault tolerance or load balancing benefits. The benefits provided by each mode are summarized in the chart below. Select [Settings] > [Network] > [Network Interface] > [Add] > [Create Link Aggregation]. The Link Aggregation Wizard window will now appear. Select an aggregation mode from the drop-down list. 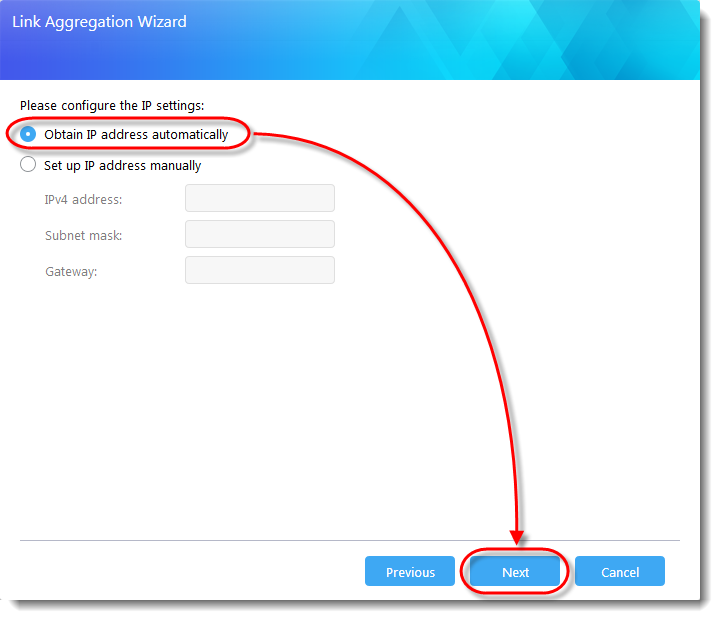 When you select an aggregation mode from the drop-down list, you will be able to see the fault tolerance and/or load balancing benefits that the mode provides. (In the example below we have selected the “Active-Backup” mode which provides only fault tolerance benefits). After you have finished selecting an aggregation mode, click [Next]. Select the [Obtain IP address automatically] radio button and click [Next]. (You may also choose to set up your IP address manually if you wish). You will now be able to see your two connections. You can click on the icon towards the right to view more detailed information.